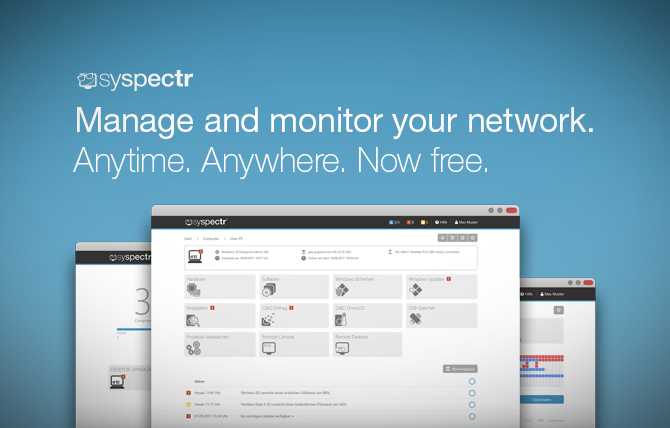 Today we have good news for you: Our IT Management solution O&O Syspectr is now in its full functionality entirely free of charge! It can be used on any number of devices (Windows desktops and servers; Fair Use Policy: if you use O&O Syspectr on more than 10,000 endpoints, please contact us)! O&O Syspectr is a successful product that we have continuously developed over the past years, and we have received a lot of feedback. We have also heard time and again that both customers and partners would like to use O&O Syspectr, but the costs are too high. Many years ago we decided to provide O&O Syspectr to charitable organizations free of charge. We have now used the knowledge and insights to optimize our running costs for O&O Syspectr in order to make it available to you free of charge. O&O Syspectr spots IT problems and tells you about them before they hurt. You are not only kept on the ball, but are ahead of the game! You can use it on your cell phone, tablet or desktop. All you need is an internet connection to watch all your systems, in real-time, 24/7, form anywhere in the world. The Remote Desktop saves you on-site visits to your customers, which will make them happy too! O&O Syspectr offers a simple yet powerful user interface that can be used in any browser and on any device. Wherever you are in the world, you have access to this information for your machines and can take corrective action if needed! Try it and see for yourself. It only takes 5 minutes to setup, it’s extremely simple to use – and it’s now FREE for everyone! What??? Sehr netter Zug von O&O! Hallo Herr Bender! Vielen Dank für Ihren Kommentar. Wir freuen uns, wenn Sie unsere Produkte nutzen und auch empfehlen! Und ja, O&O Syspectr bleibt kostenlos. Echt Klasse von euch, DANKE!